Little Richard (with Jimi Hendrix on guitar) was booked for a 10 day engagement at the Paramount Theatre in April 1965. Richard and a host of other performers were to appear as support acts to headliner Soupy Sales. 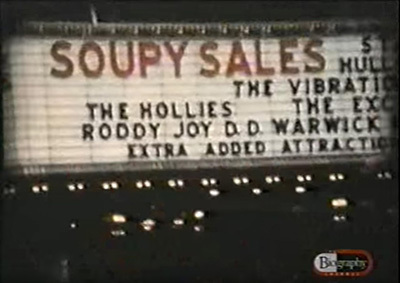 Among the other bands were the Hollies and their roadie Rod Shields shot 8mm film of the marquee outside the Paramount Theatre and some of the Hollies performance. Little Richard was thrown off the bill after just two days (see the Little Richard Live Dates -section) and thus only made an appearance on Friday 16 April 1965 & Saturday 17 April 1965. Unfortunately the marquee is only partially visible in the film, there is no way of telling which date it comes from. But if the scenes of the Hollies landing on an airport and New York city that precede the clip are in original sequence and were shot on the same day then chances that this was filmed 16 April 1965 are high. A one second clip of film of the marquee was used on the Hollies dvd "Look Through Any Window 1963-1975" 1, It can be seen during the first chapter on the disc, "Opening Montage", at 0.14-15. The stage that can be seen in the film matches the one in the pictures of Little Richard & Jimi on stage at the Paramount in April 1965 3. There is a very distinctive box on a platform on the stage with a "KC" -emblem (for King Curtis). 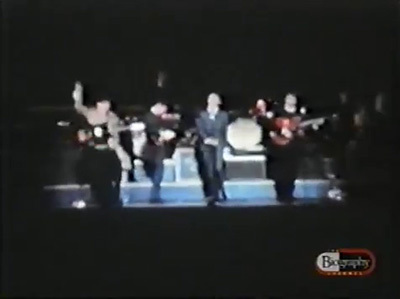 The emblem can be seen on both the Hollies 8mm film and in the Little Richard photographs. And the big question of course is, did Rod Shields shoot more film? And was the film shot while Little Richard was still on the bill? The footage of the Hollies was shot so far back that IF there was film of Little Richard you would be unlikely to notice Hendrix on stage unless you knew what to look for. - does anyone have a longer version of the 8mm film? - does anyone have contact information for Rod Shields? - does anyone have a better quality version of the Graham Nash "Biography" -documentary?